Me-Made May 2018: Week 1! It’s a duo of Closet Case Patterns! I’ve worn this stripy Ebony a ton, but it does slide back on my shoulders. The Sashas will show up on the blog soon – I like them a lot, but I can’t seem to get that smooth almost-snug fit that other people get. May 2: Comino Cap Blouse and… what? Here’s where the weather started to mess me up. Two weeks ago we had a massive ice storm, but as soon as May started it go humid and hot. I meant to wear this with the me-made pink wool coatigan on the right, but it was far too warm. Instead, I opted for the thrifted ponte blazer on the left for when I got cold at work. I like this blouse a lot in theory, but it was always snug and it’s become more so since 2016! It demands really high-waisted pants, so RTW jeans were my only choice. 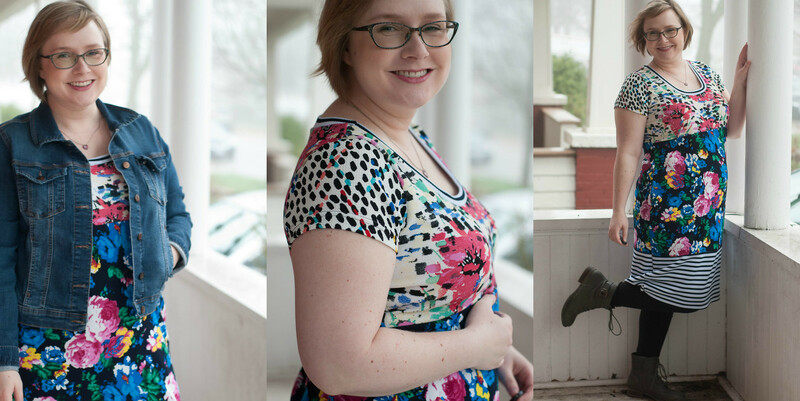 You’ve already seen my floral version of this dress – this one will make it on the blog soon! May 4: Scrappy Nettie dress (unblogged) and yet more ancient Espressos! Oh man, I am really behind on the blogging! I’ve been snapping some blog pics while I shoot MMMay pics in the morning, so you’ll see most of this stuff before May is over. On this day I had to walk students to a school tour through possible thunderstorms, so I needed sturdy shoes and something casually professional. Thankfully the rain held out and our walk was dry! May 5: Ebony Tee and Espresso Jeggings! 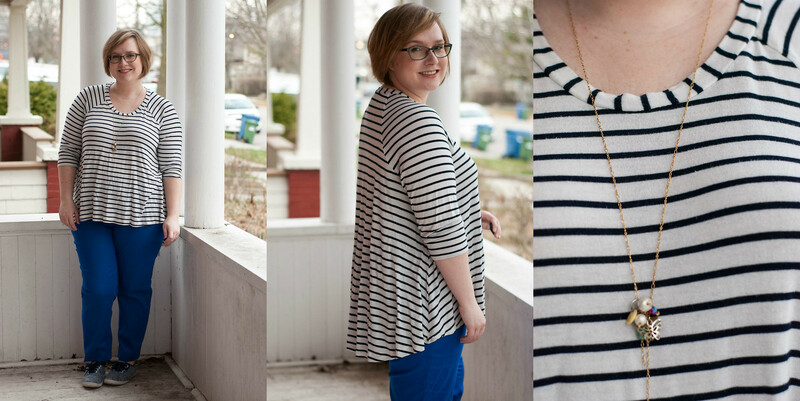 Finally, an outfit I’ve blogged! The tee was made last summer, and the jeggings are a few years old. Can you tell it’s the weekend? Are you starting to get a sense of just how many Espresso leggings I own and wear? That’s 4 pairs in one week! I love the print on this tee, but I dislike wearing cotton lycra. It does make for very comfy lounge clothes on a lazy Sunday, though! 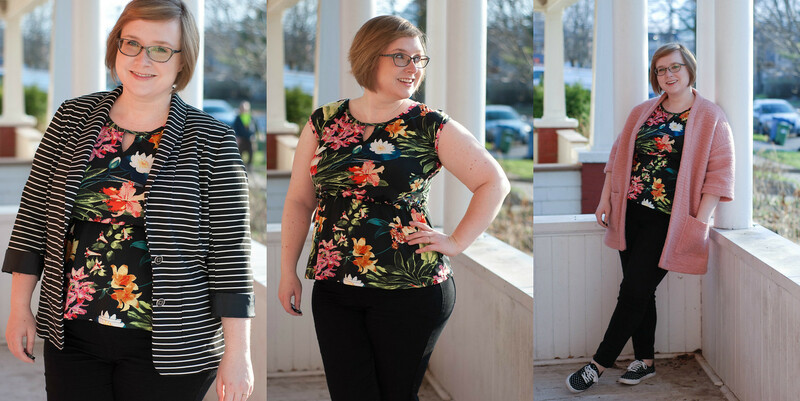 Oddly, when I look back at these pictures, I’m not sure they represent how I normally dress… or maybe it just that I’m not used to wearing spring outfits!Transitional weather is so odd, and as it gets warmer I can tell it will be harder to mix old and new in one outfit. It would be easier in winter when I’m wearing more layers! Are you enjoying MMMay so far? Your scrappy Nettie is really fun! I feel like last week was easy, since it was hot and I could just break out my old maxi dresses and such. This week will be harder, because it’ll be more temperate again, and a big problem I’ve been having this year is that my remaining separates don’t necessarily go together! Out of curiosity, what do you dislike about cotton Lycra? I’ve never used it by see a lot of people rave about it. 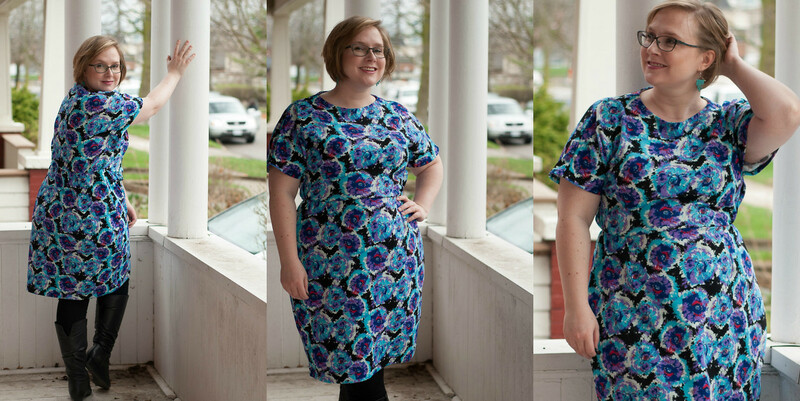 The Burda pattern is really fun! But it had surreal instructions, like hand-hemming the sleeves. WHY??? I just had an “omg I really don’t care for cotton-lycra knit” moment. It’s easy to get wrapped up in a fabric people praise but it’s so weirdly thick to me and I don’t like that cottony feel. I’ll take some sort of rayon/nylon/poly/lycra blend any day. I LOVE that Ebony tee and in that fabric. Very cute!! YES! Poly and rayon all the way!!!! Ooh, I ❤ the scrappy Nettie! We’ve also been having quite warm weather for the beginning of May (especially compared to the last couple of years), so I don’t even wear two pieces of clothing some days (except if you’re counting underwear…). I like all the outfits you put together! Also, the Closet Case patterns look great! That reminds me I still have two CC patterns to make! As for MMM, I am enjoying it immensely! It is my first year, and I can’t believe I waited this long to join in! Which two are you planning to make? 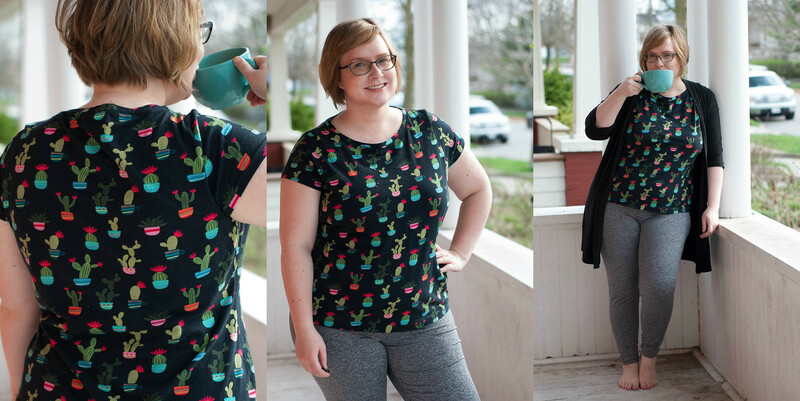 I”m in a realy Closet Case Patterns state of mind right now – I want to sew them all!